There’s only one thing better than being on vacation and that’s getting free stuff while on vacation. Come out to Sunny at the Beach Snow Cones located at 124 Jungle Road next to the shopping strip to get a perfectly shaved snow cone along with a free EdistoBeach.com sticker with your purchase. Sunny at the Beach has 15 flavors to choose from including the ever popular blue raspberry and tiger’s blood (not the same kind Charlie Sheen was into). You can also help out a good cause and get a free shirt while you’re at it. 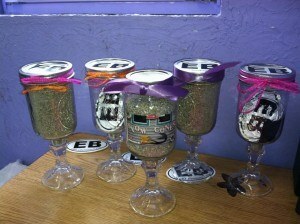 Sunny at the beach is selling souvenir hillbilly wineglasses for $5 that come with a free EdistoBeach.com t-shirt. All proceeds go to Animal Lovers of Edisto Canine Rescue. Visit facebook.com/animalloversofedsto for more information about the group and see available dogs and puppies that are up for adoption. Stop by for a photo-op with Senorita Snow Cone between 5-7 p.m. She can be found under the live oak in front of the snow cone stand. 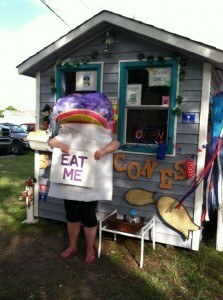 Sunny at the Beach Snow Cones is open daily from 1-9 p.m.